Saturday’s Cozy Cottage Workshop was standing room only, with attendees traveling as much as six hours to be here at SIPschool. SIPschool’s Al Cobb with Cozy Cottage in the background. Our outline for the three hour session was centered on two main topics: Structural Insulated Panels, and building very small structures. Also of great interest was the “wheels vs foundation” debate, sparking discussions on the relationship between code and zoning acceptance with small houses that move. Our Cozy Cottage is designed for another option – skids – but we’ll save that discussion for another post. Presenters included Al Cobb of SIPschool and Panelwrights, Thom Stanton of Timber Trails, Robin Hayes with BuildTiny, and Jillian Zimmerman, resident-in-waiting of the Cozy Cottage. 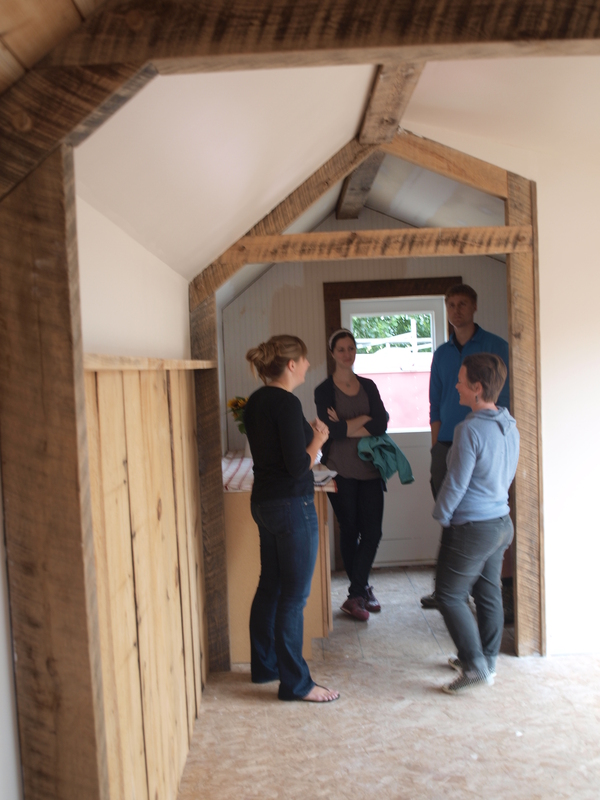 Jillian takes attendees on a tour of her kitchen space in the Cozy Cottage. This introduction to Building Small with SIPs intentionally emphasized the need to build a very energy efficient structure. Audience questions also generated several discussions on living off-grid. Dumpster diving for building materials has its place but you need to be thinking long and hard about your envelope if off-grid is your ultimate goal. The core components of your structure are the hardest to upgrade or replace. In a full-size home these would include the foundation, floor systems and the building envelope. Everything else can be, and routinely is, upgraded over the life of the structure. In small structures like those seen in the Tiny House movement the core elements are the same (swap trailer for foundation, if that’s what you’re using). Our position reflects a commitment to designing and building with SIPs. This building component may be more expensive than collecting bowed and splintered 2 x 4s from the dumpster, but SIPs will provide a fast and efficient build. SIPs have significant strength advantages over stick framed structures, but the ultimate advantage in a tiny house is the comfort of living in a SIP structure and the reduced utility costs. A truly energy efficient envelope makes the leap to off grid living with alternative energy production an affordable option. For more on this soapbox issue of mine, check out my June 2013 post “My House Isn’t Solar Ready, Yet”. And what do you think about this articulating door?